Elisa & Komron’s California wedding was beautiful — gorgeous floral arrangements, a classic black and white theme… and St. Bernard puppies! These puppies have to be some of our favorite wedding photos. 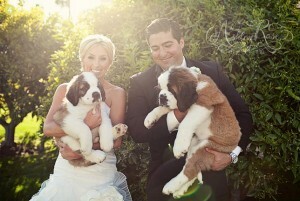 Not only in the wedding photos, but they also had some of their bridal party walk two other St. Bernards down the aisle. How cute are they? How could you not love them! Read more about their wedding here!